CTI installed an all-digital infrastructure at the Kansas City Metropolitan Bar Association using a Crestron DigitalMedia platform. KANSAS CITY, MO—”Our most important consideration on this job was to be future proof,” said Steve Martin, design consultant for St. Louis-based Conference Technologies, Inc. (CTI), talking about the new headquarters of the Kansas City Metropolitan Bar Association (KCMBA). Martin and the CTI engineering staff decided to install an all-digital infrastructure at KCMBA using a Crestron DigitalMedia platform in the facility’s most complex and demanding rooms. The single-platform digital solution includes a DigitalMedia DM-MD16X16 switcher, DM input cards, and certified DM cable. KCMBA’s offices are in the Two Pershing Square building behind the historic Kansas City Union Station. The facility includes offices, a conference center with boardroom, videoconferencing room, and a smaller meeting room, an A-B-C divisible meeting space that the association makes available to members and to other tenants of the building, plus temporary offices and working space for member attorneys who are in court or visiting clients downtown. The A-B-C divisible room includes a full complement of presentation gear plus Polycom high-definition videoconferencing. 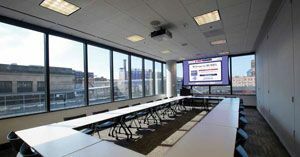 The divisible room is especially crucial because of the nature of the meetings that go on there, including continuing legal education classes (CLE s) and the recording of video depositions when witnesses or attorneys are in other cities. “Part of the challenge of a room like this is being ready for whatever someone might bring in to use in a presentation,” Richardson noted. That’s one of the main reasons why the CTI engineering team suggested the use of the DigitalMedia system. “Crestron is the only company we’ve seen that offers both VGA and HDMI on the same input plate and the only one accepting an analog or digital input into the same channel on their matrix switcher,” Martin explained. An even more important factor is DigitalMedia’s ability to collect ED ID information from the displays and supply it to the source devices, even though the sources and displays might be separated by switchers and other components. ED ID, or “extended display identification data,” is designed to enable a digital device to know what kind of monitor is connected and supply the best possible signal. So, for example, a laptop with a built-in 1280x800 screen might output a 1920x1200 video signal when connected to a display that supports that higher resolution. The problem is that ED ID is designed to be used with one external display directly connected to the source device. When you start using HDMI to Cat-5 transmitters, or if you output that laptop’s signal to multiple displays through a matrix switcher, the ED ID handshake can be lost. DigitalMedia allows the installer to specify the best resolution for each display, then makes sure that laptops, Blu-ray players, and other devices always see the correct ED ID information. It’s the difference between a system that always works and one where the screens may go blank any time you plug in a new device.